What dinosaur lover, young or old, has not envisioned a fight between Tyrannosaurus rex and Triceratops. In the near corner Triceratops, in the far corner, Tyrannosaurs rex. And the winner is? This is not your ordinary dinosaur exhibit. It places the two most famous and loved dinosaurs – Tyrannosaurus rex and Triceratops – within the context of their ecological environment and the natural forces that shaped their world. Tyrannosaurus rex and Triceratops were contemporaries, prowling the plains, creeks and woodlands of the late Cretaceous of North America, about 65 million years ago. Recent fossil discoveries and new evidence confirms that they did in fact, do battle. What dinosaur lover, young or old, has not envisioned a fight between the two? In the near corner Triceratops, in the far corner, Tyrannosaurs rex. And the winner is? Just as in a boxing match, the exhibit provides a detailed comparison of each and shows the advantages and disadvantages both would have in battle. Visitors learn that not only were they perfectly matched to fight each other, but they depended on each other to survive as a species. Facts and Clues are given throughout the exhibit to this strange paradox of interdependence. Who wins? The answer lies in the environment – the plants, forest and ecology that shaped their existence, and ultimately led to their extinction. The Exhibit explores the amazing mingled destinies of plants, dinosaurs, and mankind. The Exhibit is highly interactive and includes several award winning GestureTek hands-on displays including a visitor-controlled Pterosaur-flyer and interactive dig-pit. Additional hands-on activities are dispersed throughout the exhibit. 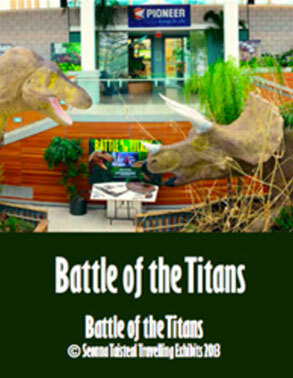 The Exhibit is a “Must -See” for all dinosaur lovers.